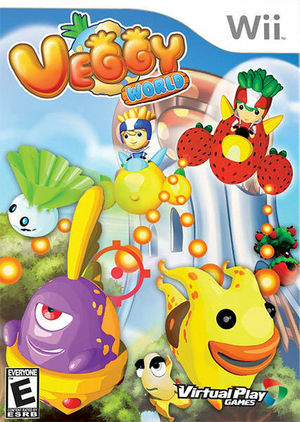 Veggy World, an action game in which you control a strawberry-shaped spaceship that flies through broccoli-covered landscapes and turnip tree houses. Fire lasers and blue pellets at a steady wave of fruit and vegetable creatures, causing the personified food to explode in a bright burst. The depiction is mostly whimsical, though you do see their "kill percentage" tallied on menu screens at the end of each round. Box includes one free pet that will become your best pal and assist on quests. The graph below charts the compatibility with Veggy World since Dolphin's 2.0 release, listing revisions only where a compatibility change occurred.